Thought it would be interesting to see what the Coast to Coast broadband coverage was likely to be during our walk in May. It will be most inconvenient is I cant upload stuff at the end of each day. I’m assuming that the daytime coverage in the mountains will be largely on existent which is a bit of a shame as otherwise I’d be able to store my pics and videos as I go along. 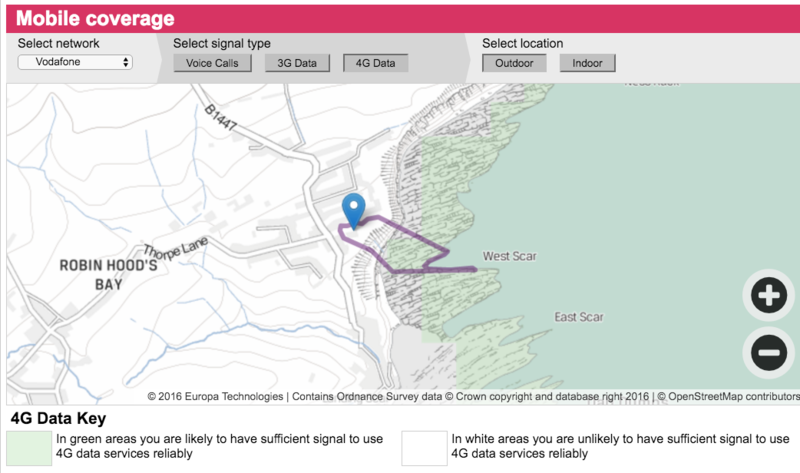 I used the BT postcode checker, EE’s own website for mobile coverage and the Ofcom coverage page. The results are below. The places with very little or no bandwidth are small villages. The larger the place the more likely they are to have service. Obvs. What I thought most amusing was that at our ultimate destination, Robin Hood’s Bay, the only network that apparently has 4G coverage is Vodafone and that is out at sea – see featured image. So if the tide is out people with Vodafone sims get good connectivity. Hopefully they have waterproof phones. Thursday Robin Hood’s Bay YO22 4RJ 46Mbps 3G Voda out at sea only! Would have been better had I been able to represent this data graphically but I can’t so never mind. Don’t forget I’m raising cash for Cancer Research UK whilst on this Coast to Coast walk JustGiving page here. The start date of the walk coincides with the anniversary of my mother’s death on May 1st last year. Mam was Chairman of the Marown & District branch of the IoM Anti Cancer Association.